Downtown Wellington is hemmed in by hills to the north, west and south, while an arc of shoreline contains the town along the east. Because of the natural boundaries, the city centre has remained small and has taken a depth over breadth approach to its development. Aside from the parks, museums, cafes and shops along the way, the walk around the waterfront is peppered with unexpected and inspiring finds. 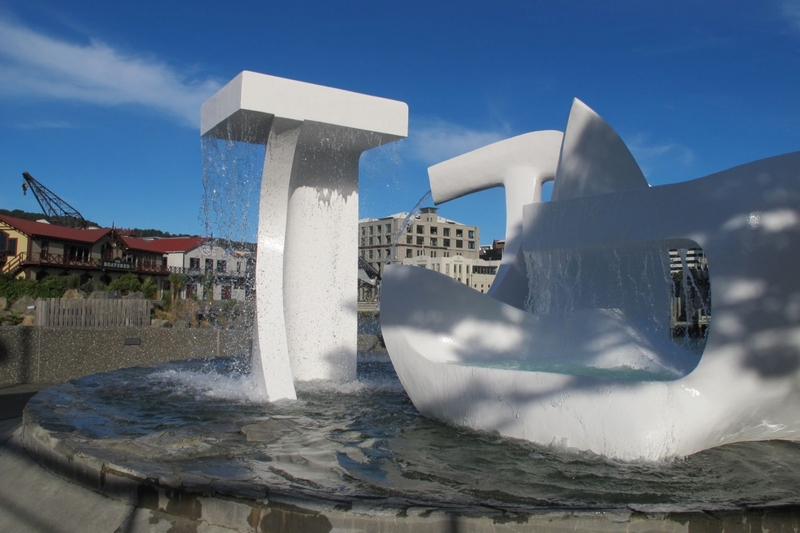 The Wellington City Council tries its hardest to live up to the city’s self-designed identity as ‘New Zealand’s Capital of Cool’, in part by investing in public art. Fling spray, it does. The choreographed water ballet lasts for twelve minutes and is scheduled daily at 10am, 11am, 12 noon, 1pm, 3pm and 6pm, 8pm, 9pm and 10pm. Of course, this is windy Wellington, so the sculpture has been designed to remain off if wind speeds are too high. There’s a light mounted on the pier to indicate if it’s too windy for a performance. One of the oldest sculptures along the waterfront, Albatross by Tanja Ashken was installed in the mid 1980s. Made up of three, white abstract shapes interacting with water, the sculpture does have a distinctly maritime feel. 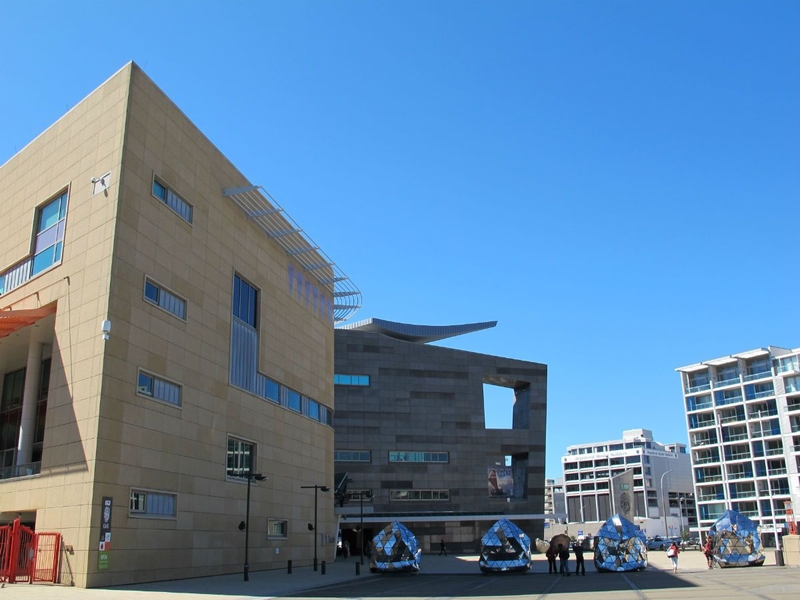 If looking at the sculpture inspires further exploration of the sea, you’re in luck: paddleboats and canoes can be rented nearby. The printed word becomes visual art in this showcase of Wellington’s contribution to New Zealand’s literary culture. 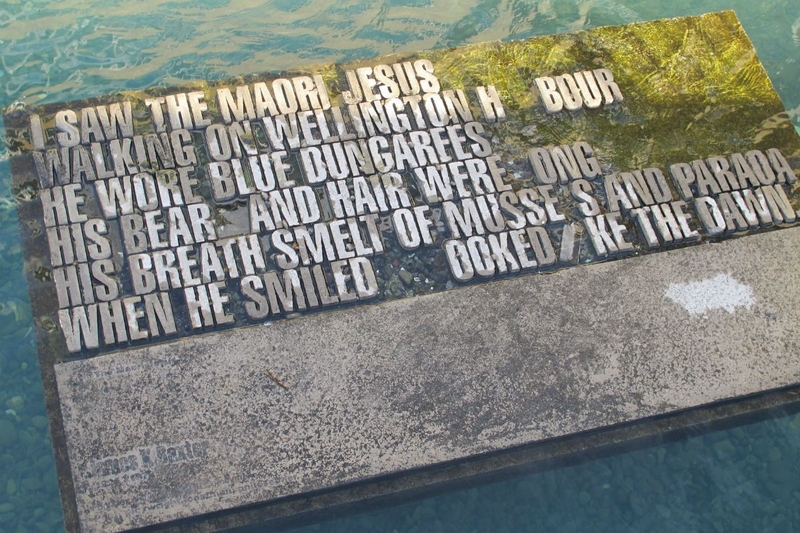 For these pieces, a quote by an author with Wellington ties has been turned to sculpture by typographer Catherine Griffiths. The eleven original pieces have been subtly installed all along the waterfront. See if you can find them all (it’s harder than you’d think). A hint: be sure to check in the pool behind Te Papa. 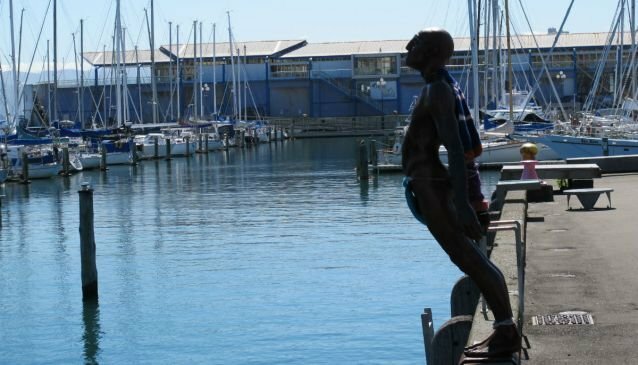 ‘Solace in the Wind’, the naked man leaning over the edge of the harbour as if being held up by a gust of wind, is the work of Max Patte - an Englishman who came to Wellington to work at Weta Studios (the effects company behind movies like Avatar and the Lord of the Rings trilogy). 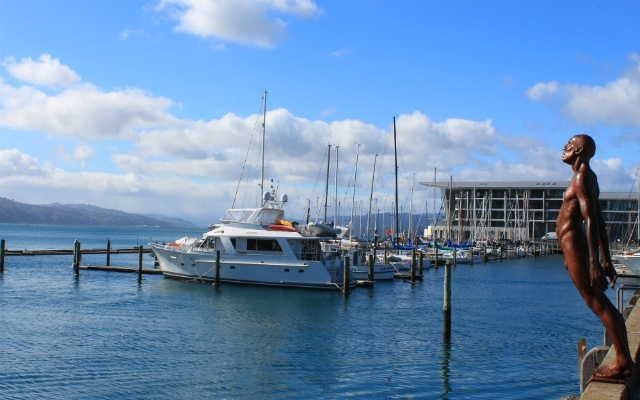 Patte was inspired to create the sculpture in response to his own feelings about the Wellington waterfront, a place that he found comforting during difficult times. While the wind might not feel solacing to everyone, it is an inspiring statement on the emotional ties we develop with places. Connecting the waterfront to Civic Square (if your interest has been piqued by the Writer’s Walk, you might want to detour this way - it takes you straight to the public library), the City to Sea Bridge is probably the most functional piece of art in downtown Wellington. 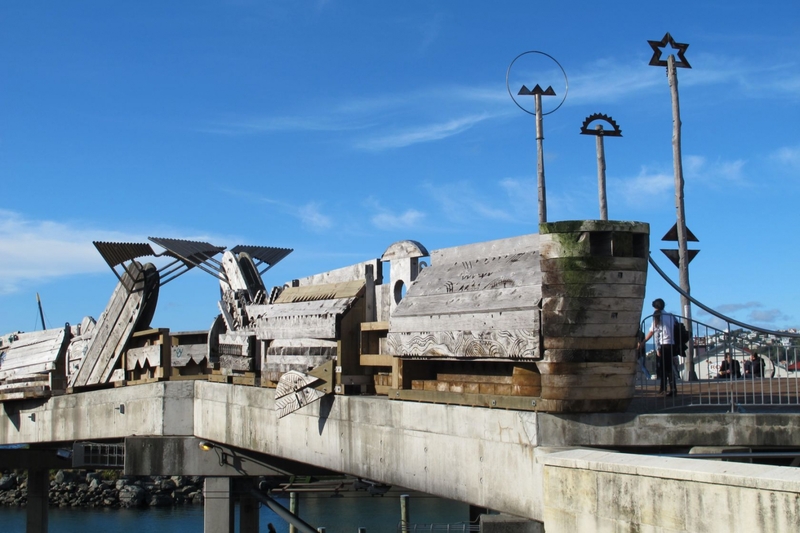 Designed by Maori artist Paratene Matchitt, the bridge symbolises the origin story of Wellington Harbour - supposedly created by two taniwha (sea monsters) who once lived in a lake. In an attempt to reach the ocean, they crashed through the earth, their bodies carving an opening that turned the lake into a harbour. Look for the taniwha carved into the side of the bridge. Atop the bridge, the sides are carved with benches and alcoves that make for a great perch for people watching. Just past Waitangi Park is Te Waka Pou by artist Ra Vincent. 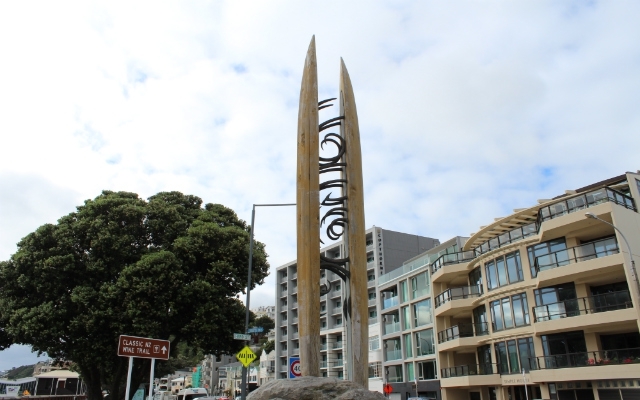 Made by two posts rising high into the air and connected by striking koru patterns (symbolising the fern frond), Te Waka Pou is a commemoration of migration to New Zealand. The sculpture sits on an historical waka (canoe) landing site, marking the spot where migrants once arrived. From here, you can watch the ferries coming in to port, bringing visitors over from the South Island and the airplanes tilted downwards as they land at the airport on the other side of Mount Victoria. Today, the harbour is still the first sight of most new arrivals.